Prime Minister Imran Khan is the first head of state to visit the Southeast Asian country since Mahathir Mohammad became Malaysia's PM. —Photo courtesy PTI's official Twitter account. Prime Minister Imran Khan on Tuesday night reached Kuala Lumpur on a two-day official visit of Malaysia, according to the official Twitter account of the government of Pakistan. He was received by Deputy Minister of Foreign Affairs and Deputy Minister in the PM Office of Government of Malaysia. According to the official Pakistan Tehreek-i-Insaf Twitter account, the delegation accompanying him comprises Foreign Minister Shah Mahmood Qureshi, Finance Minister Asad Umar, and Adviser on Commerce Abdul Razak Dawood. 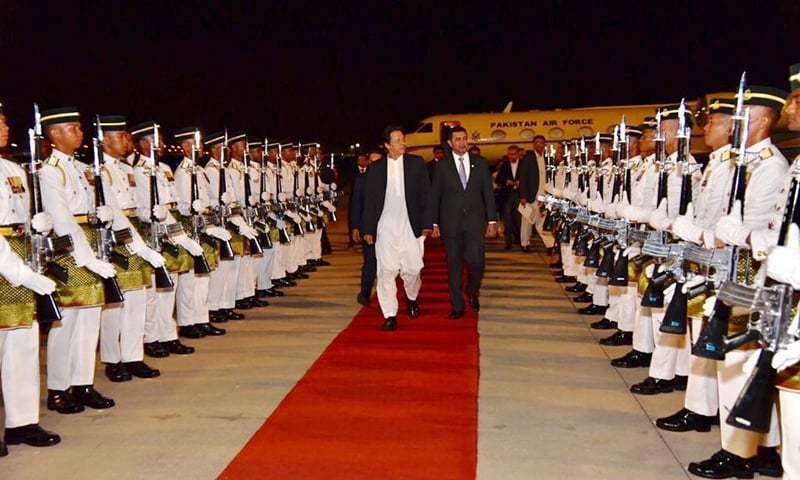 PM Khan, according to Radio Pakistan, is the first head of state to visit the Southeast Asian country since Mahathir Mohammad became the Malaysian PM for a second time earlier this year. The prime minister and his Malaysian counterpart are expected to hold a one-on-one meeting before the two countries' delegations delve into detailed discussions. The prime minister's visit to Malaysia will be the last of his trio of planned foreign visits since assuming the top office. PM Khan has already been to Saudi Arabia and China, both of whom had assured him of financial assistance in the face of Pakistan's mounting balance of payments crisis. On October 18, PM Khan and Malaysian PM Mahathir had held a telephonic conversation, in which the former had emphasised Pakistan's "close and cordial" relations with Malaysia. PM Khan, highlighting the "need of high-level bilateral exchanges" between the two countries, had said that Pakistan and Malaysia should collaborate at an "operational level" so that they could benefit from each other's expertise. ....& PTI was crying when NS was traveling abroad. Malaysia will information Pakistan as to how they have managed to get out of Chinese debt trap. Maybe IK can learn from Mahathir how to handle China. @boby, Please avoid criticism just for the sake of criticism. Malaysia itself is burdened with debt. It will not offer any loan to PMIK. @boby, of course PTI was crying and rightly so because NS always used to travel abroad with a mega delegation. Their sole purpose was to enjoy the hospitality at the expense of the tax payer and do their own private stuff. NS spent more time in London than visiting any other country. All paid for by you, me (assuming you pay tax) and other taxpayers. First leader I have seen after long time who is really making some efforts. Only time will tell if his strategy is good and be fruitful. Few minutes ago came the news from BBC that IMF has denied loan to Pakistan. Is it true?? Mahatir is a legend. IK can learn alot from him. More than the dollars, IK can ask for Mahatir's suggestions about the ailing economy of Pakistan. @boby, "....& PTI was crying when NS was traveling abroad." Because NS spent weeks on end in UK and SA for personal reasons. Last working trip if IK to UAE was just one day. Big difference! @boby, .Yeah PTI objections were right, as Nawaz Sharif visits were mere personal in nature for family benefits. The only one agenda for instant PM IK visit to Malaysia is gathering funds to be saved from IMF incursions. Better visit countries where export of Pakistani goods are possible. I hope this open more doors of trade and services exchange. Net out come will hover around increase in trade so that Pakistani exports could be increased to earn some dollars other wise Malayasia is not in a position to extend hard currency loans. @Siku, this is a result of what NS and his goons have left Pakistan with. Met by a Dy minister.What next? @boby, NS travelled only for sightseeing & fun, he was not capable to hold any meaningful dialogues that could benefit Pakistan. Can u recall any productive trips by NS ? Guard of honour welcome for PM Imran Khan - all this is done because of his integrity, dedication and determination to dispel corruption and black sheep from our society. The world has now realised the potential of Pakistan and giving new government a well deserved respect that previous PMLN and PPP governments failed to get because of their corrupt practices. What abt first 100 days no foreign visit jibe. I will be traveling on PIA and save millions! Good decision to strengthen relations with friendly countries such as Saudi Arabia, China, UAE, and Malaysia. Sad to see negative comments. Maybe you really don't want anything good for Pakistan. No. Attempt to get expertise to get to ill gotten wealth hidden in Swiss Neutral accounts. Is that clear now? @boby, at least IK is not looting the country. @bkt, Don't worry! the present gov is coming hard on a lot of things and people. This is just the start of their tenure and everybody who had been sleeping for decades has suddenly gotten up and started to put his demand in front of it. For past 30 years or so no prime minister of Pakistan has ever got worried about the deteriorating state of the economy. Khan is the first PM since then who has really taken the responsibility of streamlining the things. I wish him well in all his endeavors. @boby, Nawaz was not travelling on official visits he was travelling to London all the time for vacation and private trips. Our money shortage is over and with Malaysia we can have great trade ties. This trip is to boost trades. But Malaysia needs to treat us equal. 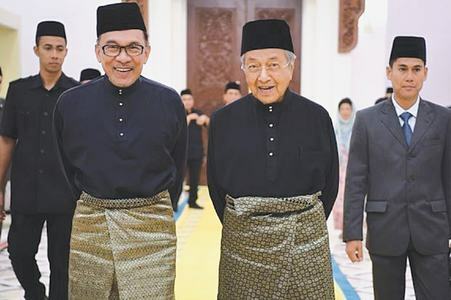 To start with, PM Mahathir should have received PM Khan. Received at the Airport by the Deputy Foreign Minister. I hope he learns how to avoid U-turns from his mentor. @boby, It’s NOT a holiday trip.... there are many common areas for working together as Muslim nations for the good of common person. Unity among Muslim Nations is a great start !! @boby, Man, can you not find the difference in when Nawaz Sharif traveled and when Imran Khan travels? Here's some reality for you PML-N supporters. If it weren't for PML-N and PPP destroying the country financially, Imran Khan wouldn't have to take these trips. In case you are wondering, let me enlighten you, Imran Khan is there working on doing business with other countries, in imports and exports, finding ways to increase our revenue, which helps some ungrateful citizens like you. You should be praying for his success, not bad mouthing him. @bkt, In order to stabilize the country and its economy, you need money, which the new government does not have, thanks to the previous governments. Unless of course if you know a way to stabilize your finances by looking in the mirror, or some magic wand. @boby, Look at the body language of Malaysians and how they received him. Same in KSA and UAE. NS never commanded this much respect - Anywhere. He may have been PM but he was No leader. @Swiss Neutral, yes. Any problem?? @boby, NS is not capable of having conversations without a cheat sheet and certainly not about this topic. IK and team are trying their best to generate future trade and learn from countries that have done phenomenal. There is a huge difference between making trips for personal happiness versus betterment of the country as we all know. Personal happiness trips using people of pakistan funds is not acceptable and InshaAllah those perpatators will be punished. Imran PM also intends to visit Canada, Japan, Germany, France, UK, Singapore and hopefully the USA. He will travel courtesy of the hospitality of PIA airlines and stay in PIA hotels. Reputedly they have each oferred him some financial aid. If all the offers materialize then maybe we will have no need for the IMF loans. @bkt, 100% agree. Forget everyone else and just stand on your own feet. Time has come to make tough decisions. Prime Minister Imran Khan is not the Head Of State. He is Head of the Government. The president of Pakistan is the Head Of State. @boby, Nawaz Sharif was travelling for personal gains. His family & his cronies used to travel with him in hordes, living in expensive hotels & spending taxpayer's money lavishly. Imran Khan doesn't do all that. Technically, he's not head of the state but head of the government. In Pakistan, the president is called the head of the state. @boby, there is a difference between travelling abroad for fun and for reading through a paper than traveling to improve relations, seek investment and only travel with a handful of people. With NS we saw the whole clan just there to have free lunch! The man is trying his best to improve the sorry state of affairs we find ourselves in and here we have people like you spreading negativity and pessimism. You should have a hard look at yourself in the mirror and find the answer to 'Is Imran Khan more qualified and honest to lead this nation or NS who has had three opportunity and still we find ourselves with 'balance of payment issue'.. and the list of issues which only the so-called experienced administrators left for this poor country. @Joe The big question is whether PM Imran Khan wants to come out of debt-trap. When in opposition, he criticized CPEC. After becoming PM, he made a U-Turn but won't make terms public. Does he have courage to make another U-turn? If he does, what credibility he will have. @boby - maybe you should check your facts first. NS in 6 months traveled all around the world with a army of people with absolutely no gain for the country. he was showing off his power. there is a stark difference with IK vists vs NS visits..only if you people open your eyes !! Nice looking Khan in Pakistani uniform. Probably first instance. @boby, : NS was money laundering! @Imran, at least no body is giving Dharma like IK. Now you have problem with verbal criticism also? @boby, Every trip by IK and his selective team has been productive and in the interest of Pakistan. Be real boby..
@Joe, unfortunately that option is not available for Pakistan. @boby, PTI 3 and PML-N 300. What comparison. Another South East Asian country getting closer to Pakistan. IK is admired and respected by so many. @boby, NS was traveling for personal reasons to save his looted wealth, every time from all corners of World, leaving Pakistan via London and coming back via London, just check his record, he asked FO, not to record my stays in London, a big liar. PTI cannot not replicate Mahatir's vision in Pakistan with the likes of Fawad Chaudrys, Sheikh Rashids and Jehangir Tareens. @LARKANO, No, in principle they agreed but modalities have to be worked out. @Just Saying, Nothing to learn about China but how to get rid of the corrupt from within the system , top to bottom. @Prateik, Modi too should go to Malaysia as he too has $650 billion loan drowning his country. Malaysia has its own problems which resulted in the reelection of Dr Mahathir . 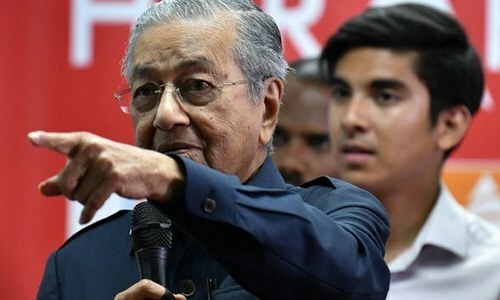 His advise on how to handle the corruption of his predecessor, balancing the relationship with China and the lessons learnt from fast economic development of Malaysia in the first term of Dr Mahathir will be valuable. Pakistan will benefit if it learns and applies the lessons.